Знание - оружие, и книга - вечный носитель премудрости. И идеальный спутник в пути! И это хороший пример того типа работы, которая развлекает, но при этом несет неожиданную информацию и заставляет задуматься - "Graphic Standards Field Guide to Residential Construction"
A must-have reference to more than 100 common residential conditions—from accessibility issues to working with zinc Practical information that the architect, engineer, contractor and homeowner can access quickly, with over 230 supporting tables photos and details Identifies frequently used reference standards, acceptable practices, and other relevant resources Quick, reliable answers to your most common on-site questions When you're in the field, you never know what you'll come across. 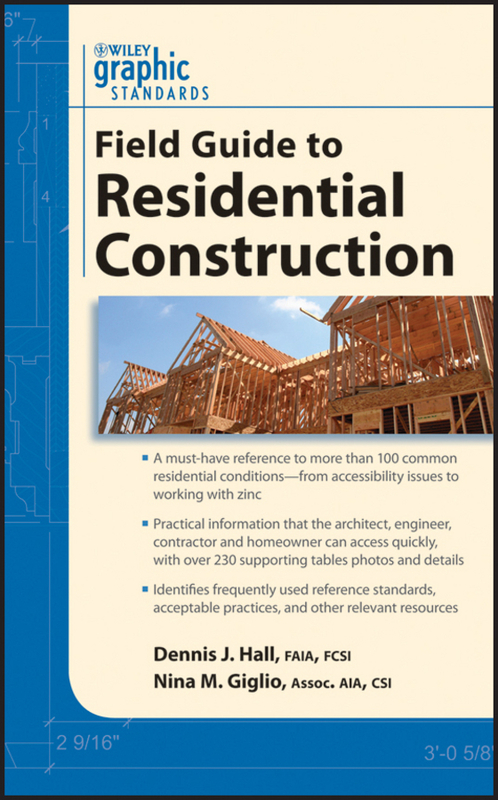 Graphic Standards Field Guide to Residential Construction gives you fast access to the information you need when you're on-site and under pressure. Presented in a highly visual and easily portable format, Graphic Standards Field Guide to Residential Construction is organized by CSI's MasterFormat and is coordinated with the 2009 International Residential Code, as well as current sustainable practices. It addresses issues pertaining to residential construction by covering every aspect of the process, such as the use of materials, structural concerns, finishes, thermal and moisture protection, accessible design applications, and more. Graphic Standards Field Guide to Residential Construction extends beyond the studio, with: Quick access to essential information wherever you are Graphic Standards-quality details accompanied by photographs and tables Illustrations that help you troubleshoot problems, along with on-the-spot solutions Compact format that's easy to reference and carry along Graphic Standards Field Guide to Residential Construction is a handy companion that offers the essential tools that time-crunched professionals can turn to in an instant when dealing with clients, or when handling the many complex demands surrounding construction management. Выражаем надежду, что "Graphic Standards Field Guide to Residential Construction" окажется кстати и полезной для тех, кто не любит сливаться с толпой.